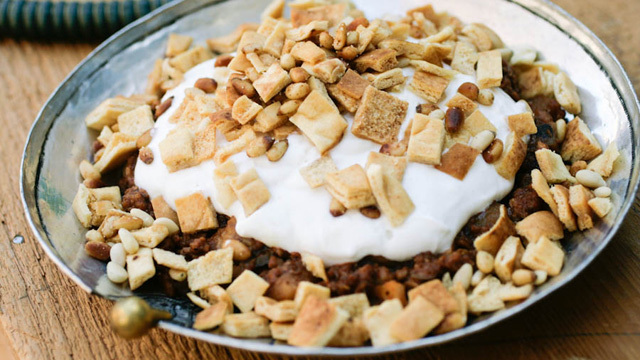 The word Fatteh means "to crumble" in Arabic and this is the idea behind this dish. Bread that is somewhat stale is crumbled, toasted, and layered with a variety of ingredients including a yogurt sauce and some fried pine nuts. This fatteh is an eggplant and minced Lamb version. It can easily be converted to a vegetarian dish by omitting the meat and replacing it with coarsely ground walnuts. There are at least ten versions of fatteh in Lebanese cuisine: chickpea fatteh, chicken fatteh, lamb fatteh, kafta fatteh, stuffed eggplant fatteh, lamb feet fatteh, lamb tongue fatteh, etc. Fatteh is a popular brunch dish especially in the coastal city of Tripoli in Lebanon. Peel the eggplants and cut in small cubes. Sprinkle generously with salt and place in a sieve over a bowl; let the salt draw out the bitter juices for several hours if possible (you will get at least one cup of dark water). Brown the minced lamb in a skillet. Break it into small pieces with two wooden spoons, add some spices: I added salt, ½ teaspoon of sumac and 1 teaspoon of seven-spice mix. Stir and cook until browned. Then transfer to a sieve and let the meat drain its grease. Cut the pita breads with kitchen scissors into tiny croutons, place in a Ziploc bag, add a tablespoon of olive oil and toss. When the croutons are shiny, transfer to a cookie sheet lined with foil and bake in a 300°F oven till dry, golden and very crunchy. Dry the eggplant with paper towels; pour two or three tablespoons of olive oil in a skillet and when hot, pan-fry the eggplants stirring from time to time until they release their flavor, get soft and browned a bit. Transfer the eggplant to the skillet with the minced meat and add ¼ cup of pomegranate molasses and a cup of tomato sauce. Cook the mixture over medium heat for 20 minutes or so, and let the sauce reduce by one half until the remaining mixture is moist but not too soupy. Melt a teaspoon of butter and one of oil (if using clarified butter, don't bother with the oil) and fry the pine nuts until caramel-colored. Drain on a paper towel. Mix the yogurt with a generous tablespoon of tahini (optional, but adds a nice nutty taste) and ½ teaspoon of mashed garlic (mash the garlic with a dash of salt in a mortar). ASSEMBLY: Place the meat and eggplant mixture on a platter, still warm. Cover with the yogurt, then top with the croutons and pine nuts.